Becoming 2011 Game 10 National Champion. 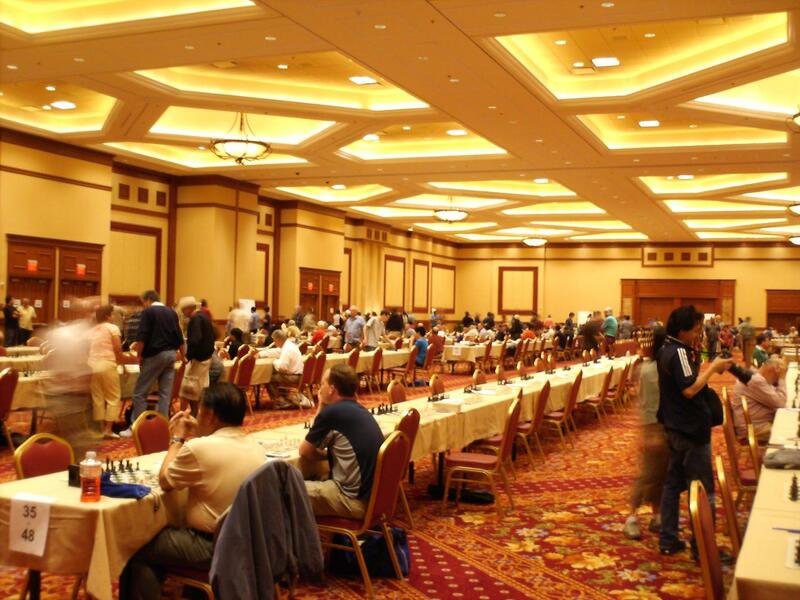 That 10 Minute Game Event became the highlight of the Vegas chess trip for me and left a very positive feel throughout the tournament. It is always great to start a tour (3 planned events) with doing super well in the 1st one by beating and drawing Super GMs, and therefore having the other 2 as a “free try”. Highlight for the Event: 5.5 out of 6 Points. Wiins over Super GMs Gareev, Van Wely, Akobian and draw vs. GM Lenderman (all 4 of them at about a 2700 USCF rating level). After beating 2 Masters, I faced a super tough GM Gareev (the winner of the recent Chicago Open 2011). Outplaying him positionally and winning a pawn secured a nice edge for me. However, in fast games anything can happen, so converting that edge to more extra pawns and then eventually grinding down an Opposite-color endgame was not an easy task. Nevertheless, it worked out well without any adventures great adventures. Next game was against GM Loek Van Wely, who is a frequent guest on the very top level. He has probably more games against people like Kramnik and Topalov than any “regular” GM had. I was very proud of this accomplishment too: Outplaying a Grandmaster like that in a positional manner and securing a win without much trouble or adventures, felt really great. The round after I was facing GM Alex Lenderman. He knew the most unpleasant line against my system and at some point it looked really scary and even almost lost for me. I probably missed some good chances when I won an exchange for couple of pawns and then got into some trouble. Few cool tactical shots saved the game and resulted in a consequent draw. The last round was against my old friend and the Las Vegas real tournament winner Varuzhan Akobian. The trusted Dutch defense once again secured a nice edge and even though I missed a chance to checkmate, winning a piece was enough to prompt resignation. The final result- sharing 1st prize with GM Shankland, was definitely something to be proud of. The Blitz Tournament (2 hours after the 10-minute games) could have ended up on very high notes too, had it not been for my loss to GM Kacheishvili (who in the Main tournament was the 1st place contender until losing to Akobian in the crazy last round game) exchange and 2 pawns up and the game where my clock died with my opponent having only 1 second left!. Oh, well……. Even though the Vegas tournament is always fun to play, for me it seems doing well there is always harder than in any similar tournament. Not sure what it is: in my about 10 tries there I won the event only 1 time. That was the time I was not even planning to play but GM Dzindzhihashvili (approximately right spelling I think) gave me his room because he needed a nice one. Round 1 was an unusually easy against a 2100 while Round 2 I almost lost trying to win too hard. Round 4 saw a changed pairing and I was playing Anjelina Belakovskaya. After getting a small edge and converting it into a healthy extra pawn and later even a 2nd extra pawn, I made a psychological mistake: I allowed her pieces into my side in a time pressure. It eventually all worked out fine but had she found the correct move, it would take a very complicated move sequence to win the game. As it went in the game, I ended up winning without my usual “adventures”. Round 5 I faced GM Atalik. He speaks who knows how many languages and seems to know openings very deeply. One little mistake (I didn’t lock up the Queen side) and I ended up slowly outplayed and eventually lost. Very tough being Black against very booked up and strong GMs. Round 6 was the most fun game of the Main event: playing a 2350 rated player (Yanayt), trying a double fianchetto system and while playing it in the unpretentious and simple way (develop, get center, etc), winning on move 21 because he has no chance left, was quite fun. Hope to be there next time they organize it and to see many of you have great fun there!